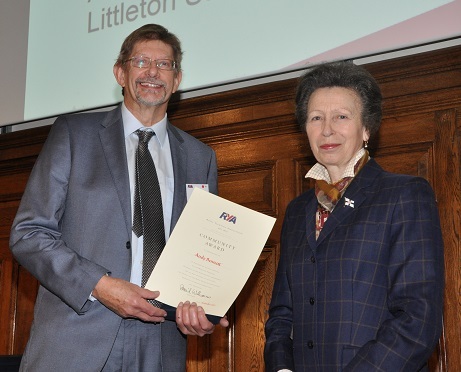 We are delighted to report that our Rear Commodore Andy Bennett was among dedicated volunteers from across the UK who had their endeavours recognised by Her Royal Highness The Princess Royal at the annual RYA Awards ceremony in London 24 November. Andy Bennett of Littleton Sailing Club (LSC) received an RYA Lifetime Commitment Award for his dedication to boating. Before the awards presentation, RYA CEO Sarah Treseder presented Her Royal Highness with a pair of marine binoculars on behalf of the RYA’s Members to mark her 30 years as President of the RYA. In nominating Andy LSC wrote: Andy has been volunteering at Littleton Lake since 1993 and has served as Commodore of the former BP Sailing Club and at LSC and on various club committees, most recently as Rear Commodore Facilities. This role encompasses the management, maintenance and repair, with a team of helpers, of LSC’s extensive boundaries, utilities and structures. A natural team player, Andy was responsible for organising major repairs after serious floods in 2014. He is helping to negotiate a lease with the landlord and has represented the club during the Thames Flood Relief Scheme consultations. and Phabsail, a local group for sailors with disabilities. His wide-ranging support has been instrumental in making LSC a vibrant and successful club.